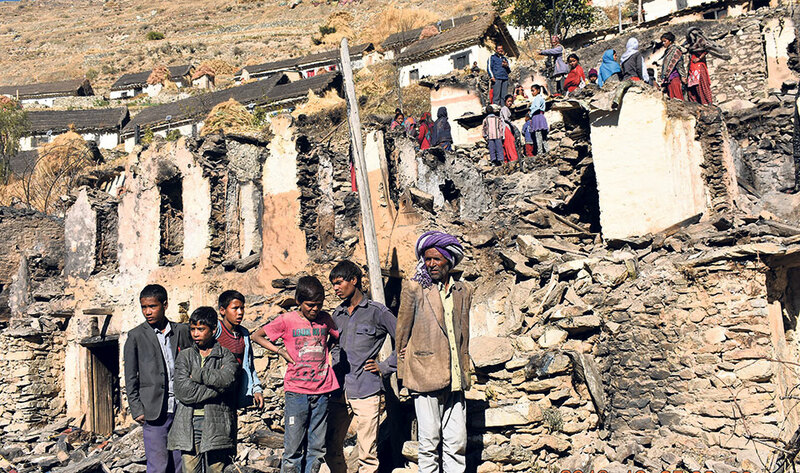 KALIKOT, Dec 29: Days after a massive fire blazed their shelter rendering them homeless, the fire victims of Khadagaun in Kalikot district are spending their days waiting for relief. As the fire burnt everything that they had to ashes, all they have is a pair of clothes. They are compelled to wait for the government and non-governmental organizations to fill their empty stomachs. Fortunately, their expectations have not been shattered as a large number of organizations and individuals are lending their helping hands to the victims. All three tiers of government, as well as private organizations, have been actively involved in managing relief for the victims of last Sunday's destructive fire. Altogether 87 houses were reduced to ashes by the fire. Karnali Province has announced to provide Rs 20,000 to each household. Similarly, the Ministry of Home Affairs has provided 200 blankets, 70 tarpaulins, 100 jackets and 100 trousers to the victims. On the initiation of the District Administration Office (DAO), Food Corporation Office, Kalikot, distributed 90 sacks of rice while Red Cross Nepal provided some blankets, tents, utensils among others. Furthermore, the relief collected in the name of fire victims in the district headquarters Manma has been transported to the incident site through helicopter. Chief District Officer (CDO) Chandra Bahadur Karki, informed that the DAO has been distributing relief by coordinating with all three tiers of government. "We have been receiving generous amount of relief from inside as well as outside the district," said CDO Karki, adding, "The victims will have to struggle for some days in the cold as the roofs of their new houses will take some time." The inhabitants of the 87 houses which were gutted by the fire have been working day and night to rebuild their homes. Seven persons were injured in the fire and 18 cattle were killed. So far, majority of the victims have been sheltering in school buildings while some are in tents. The rural municipality has decided to replace thatched roof by zinc sheets in the rebuilding process, making sure that such incidents will not repeat in the future. Bhupendra Jung Shahi, general secretary of Tarun Dal, informed that the Nepali Congress (NC) has been planning to provide relief worth Rs 2.4 million to the fire victims of Khadagaun. "NC will provide Rs 870,000 cash and I will personally distribute food and clothes worth Rs 500,000 for them," said General Secretary Shahi. He further informed that the NC would spend Rs 1 million for the health camp to be organized on January 2 for the fire victims. Meanwhile, Laxman Bahadur Balame, chairperson of Palata Rural Municipality, has assured to provide Rs 1.5 million cash to the victims. Furthermore, various neighboring local units like Sanni Triveni, Narharinath, Taligufa rural municipalities as well as Shuvakalika and Raskot municipalities have announced to provide financial help of more than Rs 100,000.